How did you get so interested in the CA&E? I have lived in Chicago’s western suburbs pretty much my entire life. 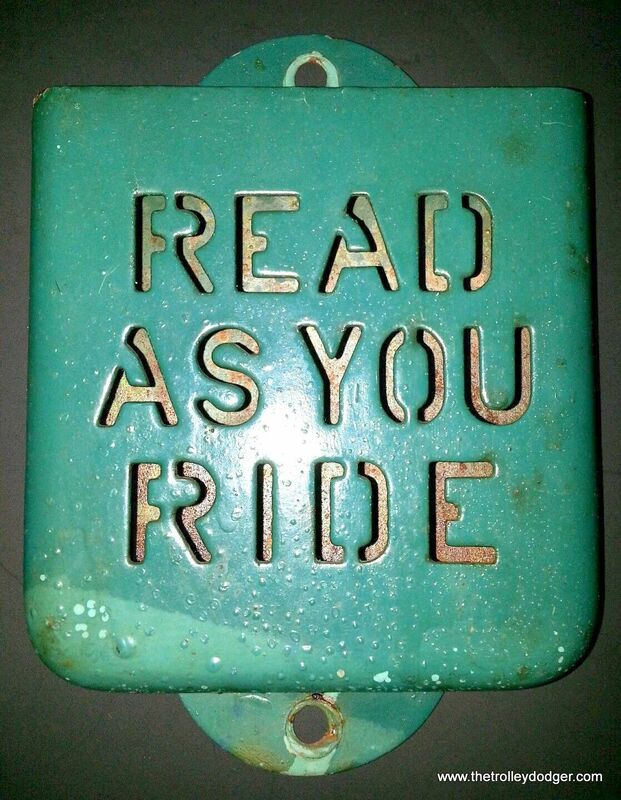 I was born in 1954 and therefore never rode the CA&E. As it was, my mother says she only rode it once, in 1946 as part of an outing with other people from the office she worked in downtown. I know my mother took the Garfield Park “L” downtown when she worked there in 1952-53, after she married to my dad. They lived in Forest Park for a time. When it was reported in the press in 1961 that the CA&E would be dismantled forever, my family took a Sunday drive out to Wheaton, where we looked forlornly at the cars in dead storage in the yard. I recall being glad at the time that they had not been vandalized. 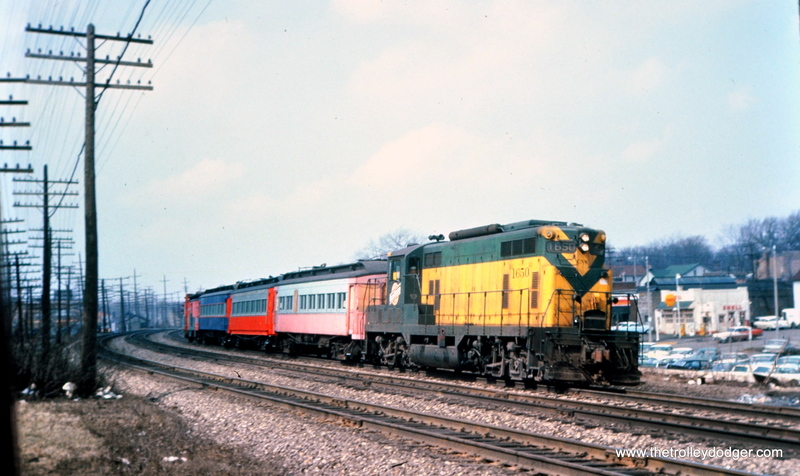 When the Illinois Railway Museum began rail operations around 1966, we drove out there to ride the trains. And I have been back many, many times since. As I grew up, I learned more and more about the CA&E, and am still learning. There were three final passenger trips that took place at year’s end in 1958. On Oct 26th the Central Electric Railfans’ Association chartered three cars (with a fourth car added later due to extra loading). It was listed as the last steel car trip and went to Elgin . 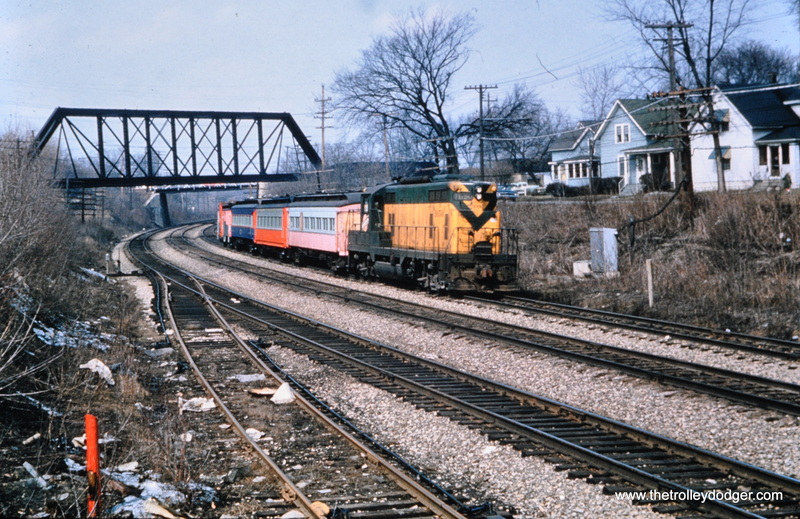 The second trip was charted on Nov 21st by a church group, and went from Glen Ellyn to Clintonville station, to the Fox Valley RR club. The final one was on December 7th 1958, which I sent you many photos of, but I may have some more. Mark did in fact send us more images, reproduced below. The ones from the final fantrip have also been added to our previous post A Cold Last Ride (January 25, 2016). We thank him for his generosity in sharing them with our readers. 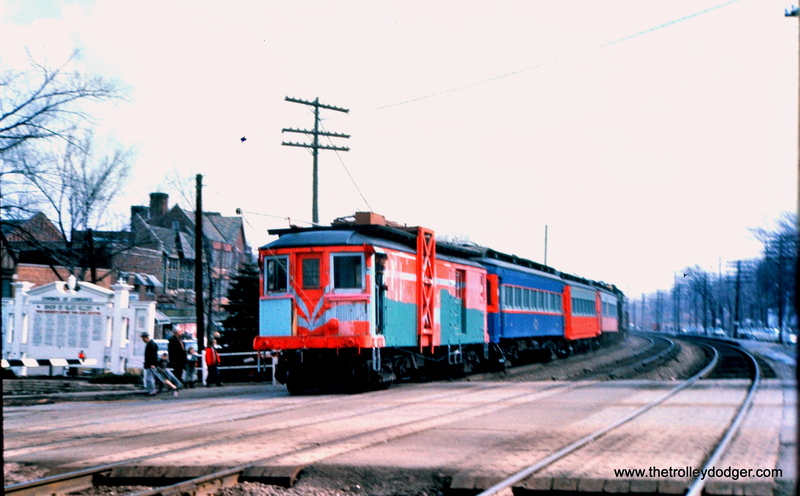 The CERA fantrip train on the CA&E at Raymond Street, October 26, 1958. (Mark Llanuza Collection) This is the same curve where several photos were taken during the December trip, where we got them identified as near the Corrugated Box Company. 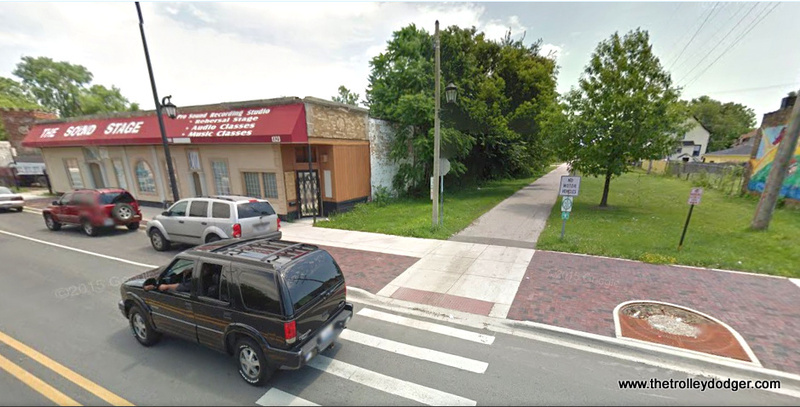 Fifth Avenue in Maywood as it looks today. We are facing east. 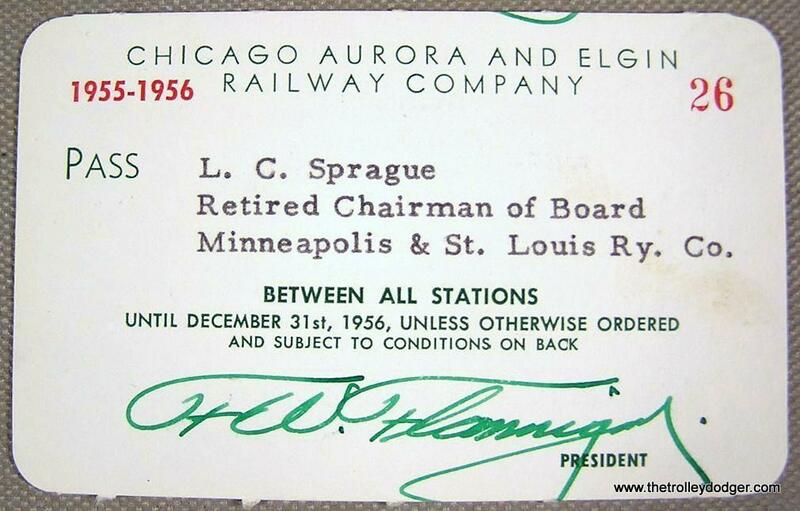 Lucian C. Sprague (1882-1960) was president of the Minneapolis and St. Louis Railway from 1935 to 1954, and received this pass from the Chicago, Aurora & Elgin. Officials from various railroads gave each other these sorts of passes as a professional courtesy. 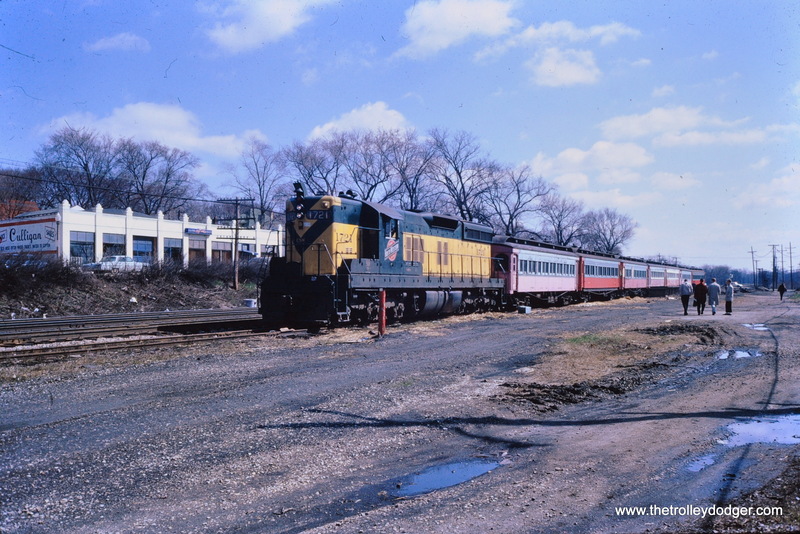 The Chicago & North Western bought the Minneapolis and St. Louis in 1960. There was recently some discussion on Facebook regarding CA&E’s extensive use of uncovered third rail without fencing. It was noted that this arrangement had been in place since 1902 and residents of Chicago’s western suburbs were used to it. However, there were various signs warning of the dangers. If the CA&E had survived to the present time, no doubt there would be more protections in place. 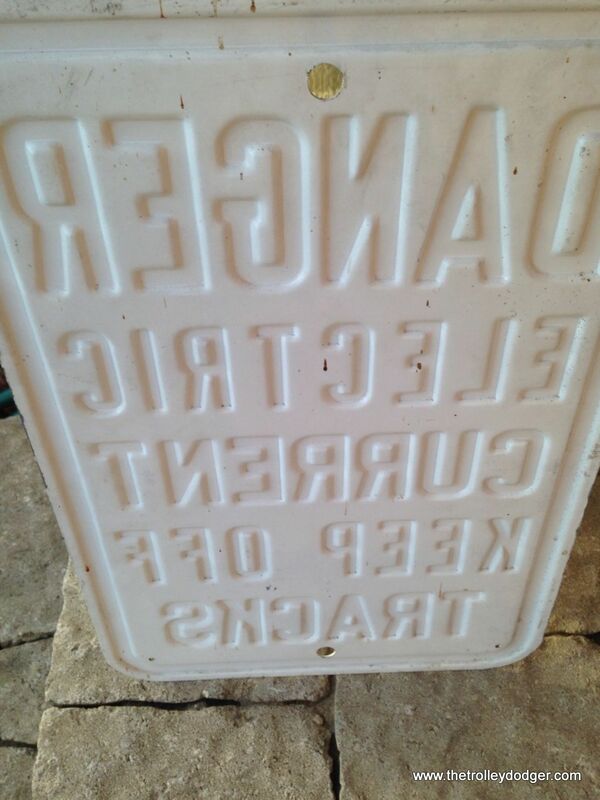 This metal sign, said to have been used on the Chicago, Aurora & Elgin, recently sold on eBay for $280. Thanks for the recent posting of all the great CA&E pictures on The Trolley Dodger blog. Some really fascinating images in that post. I am a member and long time volunteer at the Rockhill Trolley Museum in Rockhill Furnace, PA. We have CA&E 315 at our museum and we are in the process of restoring the car to its original condition as built in 1909,or as close as we can make it. One question that had always wondered me and others at the museum is how did 315 get out of Chicago and are there any photos of the car after the CA&E abandoned operations? 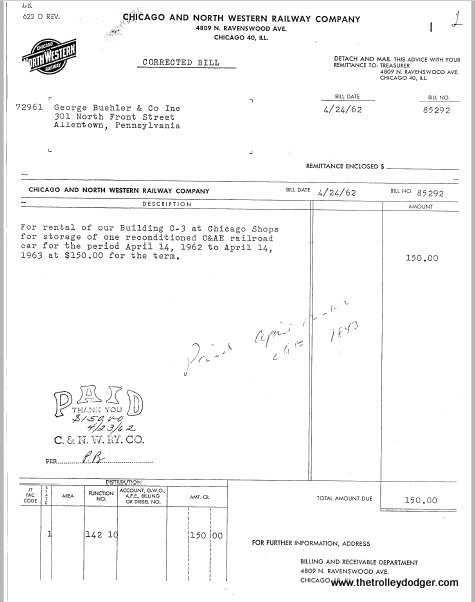 We know the car was stored in a CN&W roundhouse for nearly a year and copies of that invoice are enclosed. But the big question is when did 315 leave the CA&E for the last time and are there any photos of that move? 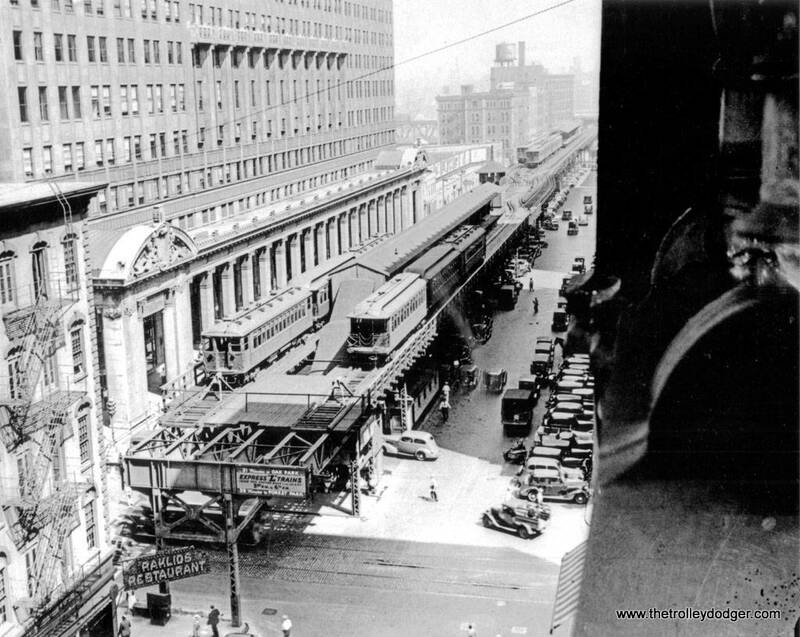 We do know when the car was ready to be moved to Pennsylvania the car was placed on a depressed flatcar and the trucks placed in a gondola car and moved to Mt. Union, PA. It was moved by a highway truck 11 miles to the museum site. Do you know anyone that I might contact to help with this unknown part of the 315 story? I would appreciate knowing anyone that might be able to answer some of these questions or have pictures of 315 during its years on the CA&E as well as after abandonment. Thanks for your help with these questions. Thanks for writing. If, as I suspect, you are related to the late Gerhard Salomon, you might like to know I regard him as a hero for all his preservation efforts over the decades. I can only wish I had met the man to thank him personally. While I do not have immediate answers to your various questions, I am confidant that I can help you find out, with the help of our readers. One of my recent blog posts mentioned how the 320 (now at Mt. 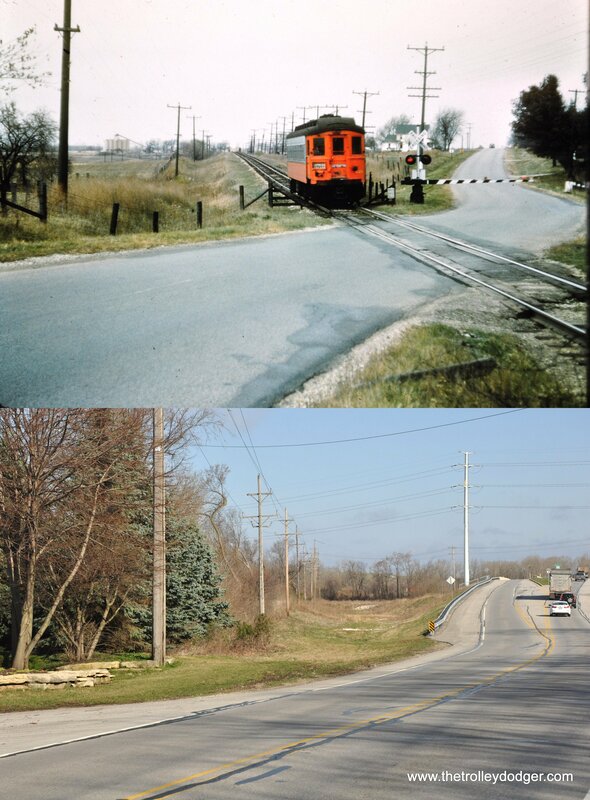 Pleasant) was the only car taken off the property that did not leave via a temporary interchange track with the C&NW. It may very well be that the 315 left at the same time as some other cars that were saved, especially the ones that were heading east. With any luck, I hope it will be possible to visit your fine museum sometime this year. Here are some interesting last CA&E moves from April 1962. 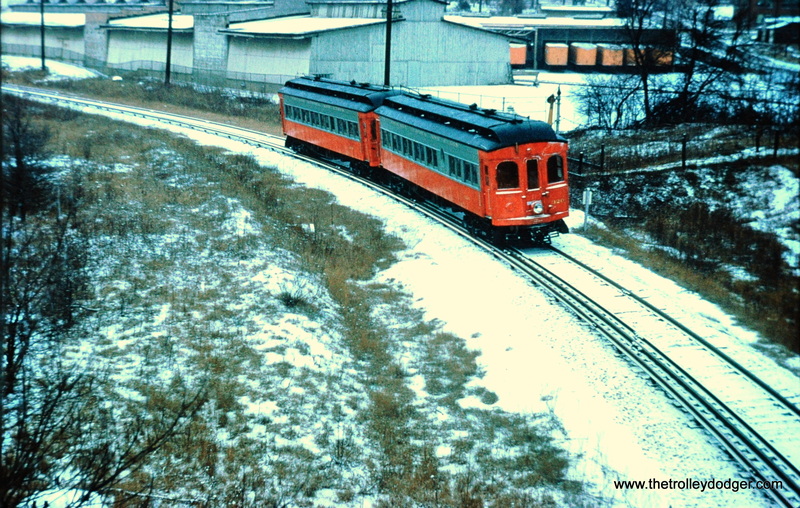 An interchange track was built at Wheaton to pick up cars from the yards. Trains were bought over to West Chicago to run around them, and they then headed back to Chicago. While these photos do not necessarily help answer Mr. Salomon’s question, they do show seven CA&E cars being moved off the property in April 1962. If there were, as I have read, three such trains of cars, with the 320 being handled separately, then perhaps we have a one in three chance that the 315 was part of this train movement. 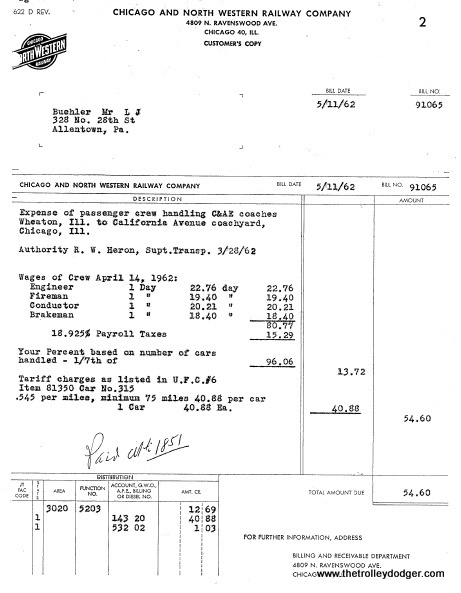 Since one of the invoices shown above pro-rated the cost for moving the 315 as 1/7th of the total, that would be another indication that it may have been in the group shown in these pictures. There most likely could not have been three such trains, as I recall only around 19 cars were saved. Maybe that improves our odds to 50% or perhaps greater. The only car whose number I can recognize in these photos is the 303, which originally went to Trolleyville USA in Ohio. However, none of the cars in this photo have curved sides, so the four cars from the 451-460 series, which also went to the Gerald E. Brookins operation, are not among them and would have been moved in a different trip. 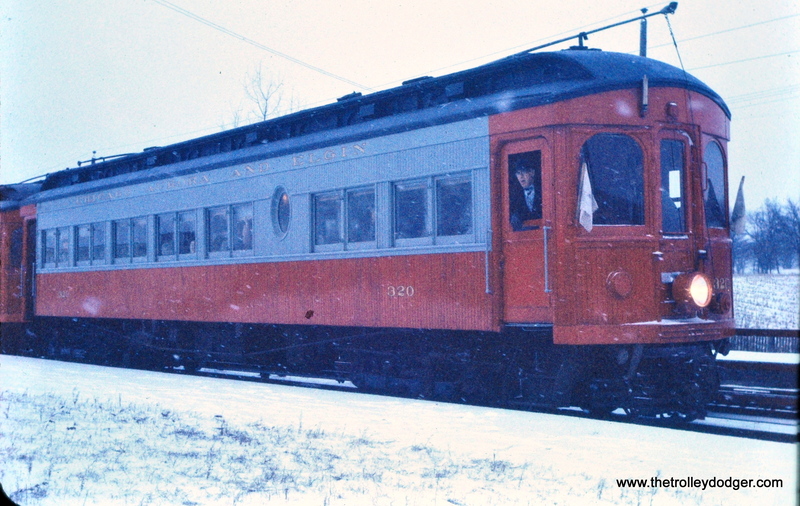 The 303 is preserved today at the Connecticut Trolley Museum. The 315 has been owned by the Rockhill group all along. IRM and RELIC each had their own “hospital train” and the 320 left separately so, by process of elimination, we can figure that the 315 was indeed in the seven-car “eastern museums” train in Mark’s photos. It looks to me like the order was 303-409-319-36-315-308-318. 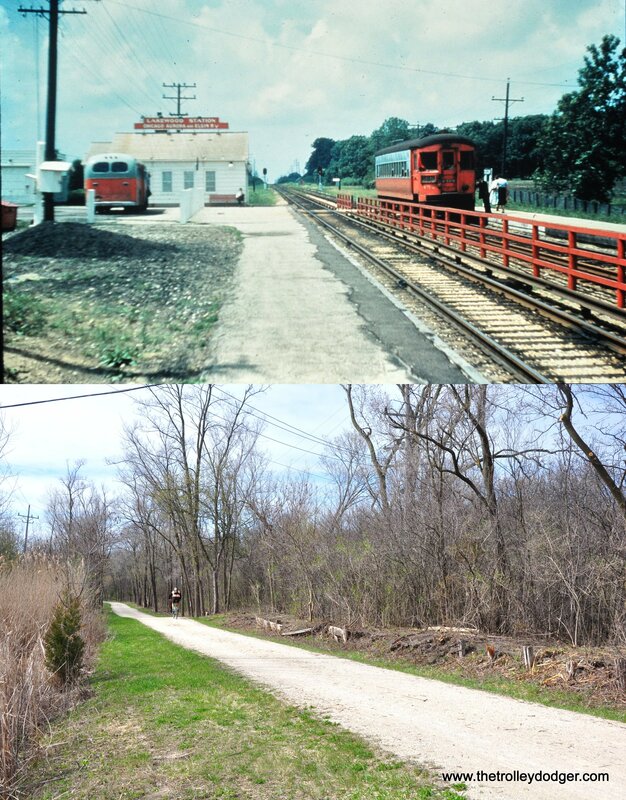 PS- The Railway Equipment Leasing and Investment Co. was the predecessor of the Fox River Trolley Museum. From http://www.thegreatthirdrail.org: The end has come for the Roarin’ Elgin. The rails have rusted over and the hallmark of the railroad, the third rail, has already been taken off of the third rail chairs. Fortunately all isn’t lost. 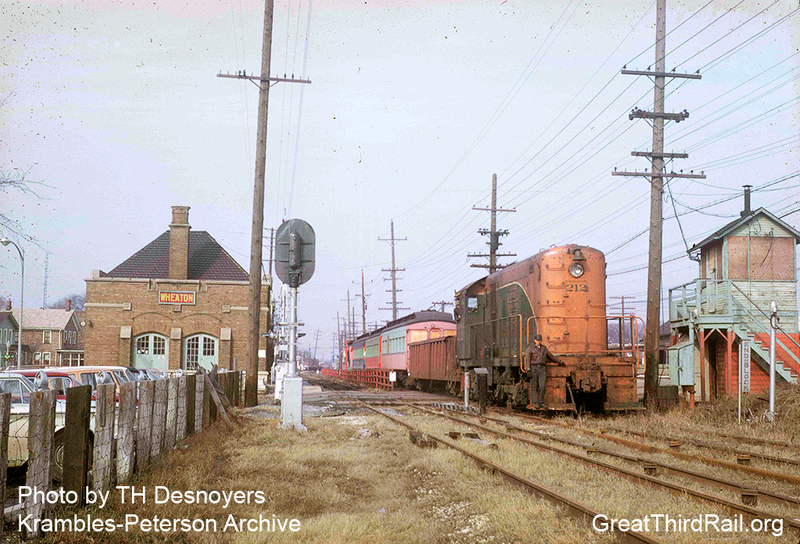 On March 24, 1962, we see EJ&E 212 hauling several CA&E cars past the Wheaton station and Main Street to be preserved at RELIC (today’s Fox River Trolley Museum). There is a thesis at Mississippi State University on Land Use in Starkville. It is about 4 inches thick. I am attaching the pages on a trolley motel which is thought to have been the largest in the world. 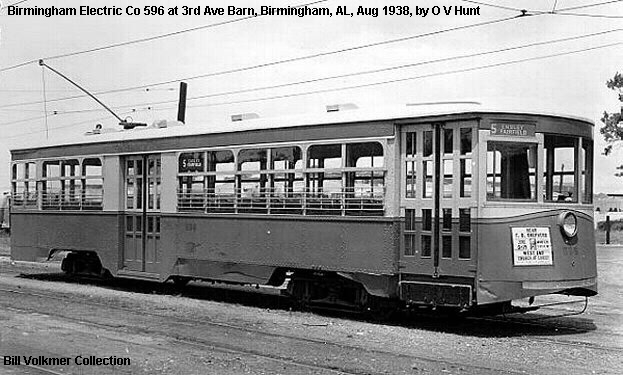 The trolleys were purchased by Vernon Chesteen from Birmingham and made into his motel prior to building one. It had a nice gas island with a streetcar diner. 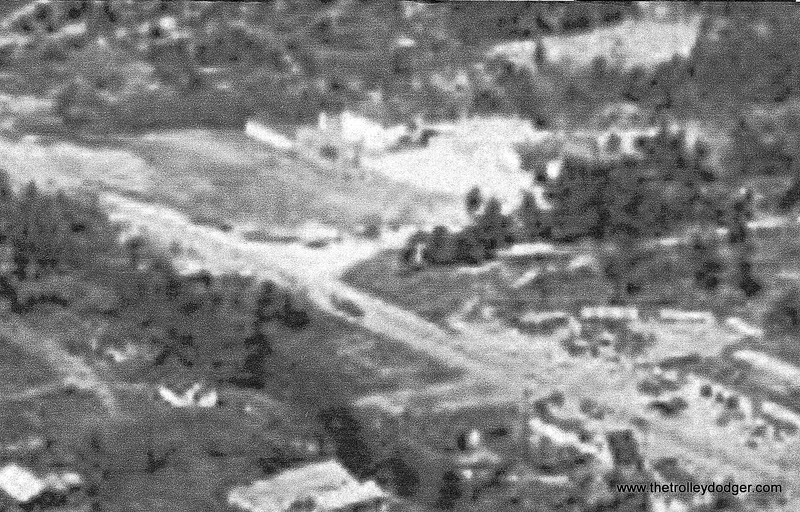 I located an aerial photo. I write an article for the Starkville paper entitled From Days Past and am trying to verify information. What I send you is true. The motel was on Highway 182 about a block west of town. I wasn’t able to come up with anything about this Trolley Motel via a Google search. Perhaps my readers might know something more. 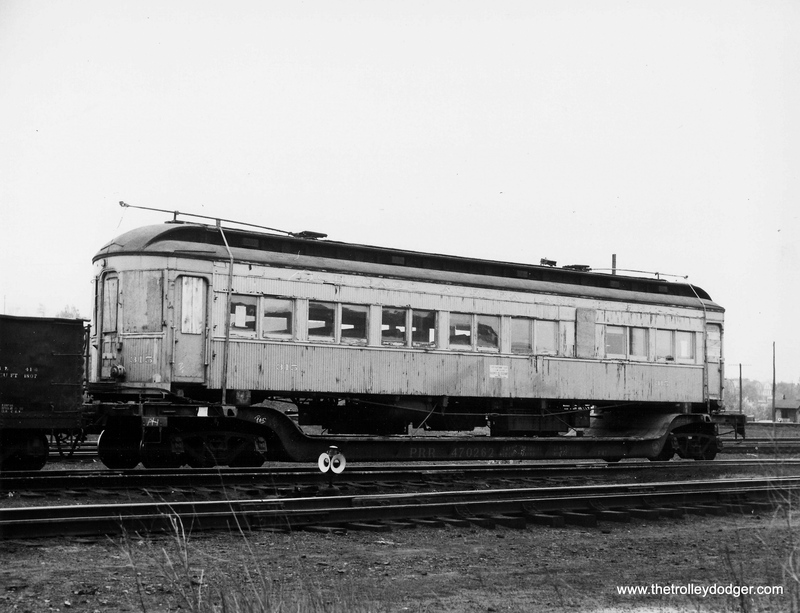 Then, in August, 1941, cars 812, 816, 817, 830 thru 833, 835, and 838 were scrapped. 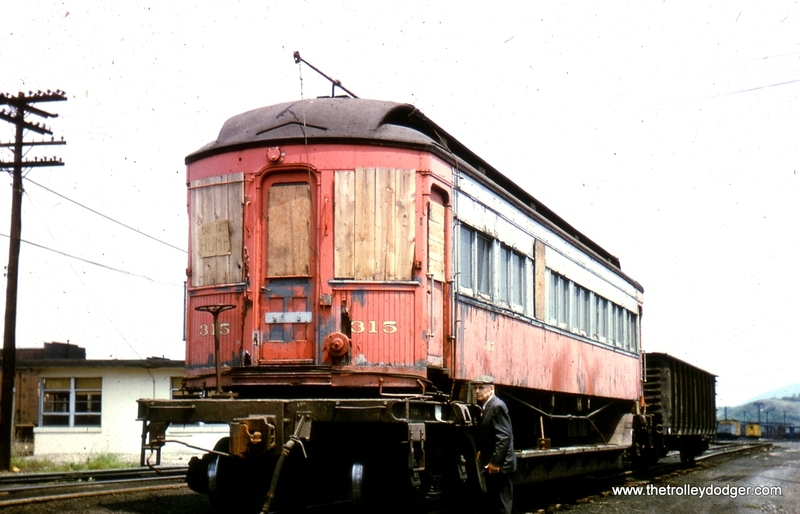 A number of these car bodies were saved for non rail use, such as sheds and cabins. Chances are those were the nine cars that were used for the Trolley Motel and associated diner. There is a picture of one such type car, which is known as a double-truck Birney. These cars were built in 1919 and 1920 by the Cincinnati Car Company, and were originally double-ended. They were eventually converted into single-end cars. 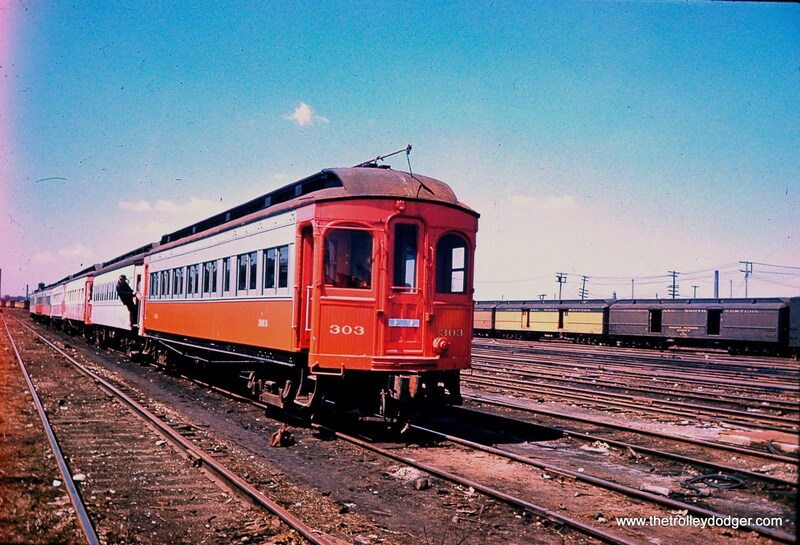 When these trolley cars were taken out of service, the motors, wheels, seats and control equipment would have been removed and saved for use on the remaining cars in that series. The car bodies would have been offered for sale, and would have been especially desirable in the immediate post-WWII era, when there was a housing shortage. Back in those days, postcards were made of just about anything. It’s quite possible that a picture postcard may exist somewhere showing the Trolley Motel. Perhaps our readers may know something. 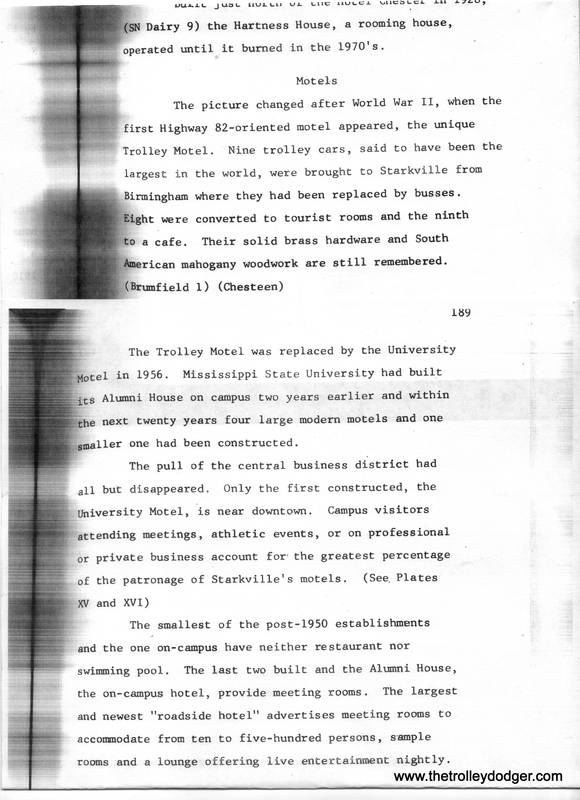 According to the thesis Lucille Liston Mitlin submitted to MSU to receive her master’s in geology and geography in August 1975, entitled “The Historical Development of Land Use in Starkville Mississippi, a Small University City,” it shows there was not much in the area during her days on campus. The Trolley Motel was replaced by the University Motel about 1960 and all the “stars” who performed at MSU stayed there, including Johnny Cash. The motel no longer exists. Thank you so much for your research. This section of a 1975 dissertation describes how nine streetcar bodies from Birmingham, Alabama were used in a “Trolley Motel” in Mississippi. Eight were used as cabins and the ninth was a diner. An aerial photo, probably from the late 1940s, where you can just barely make out (at right) some of the streetcars in the Trolley Motel. 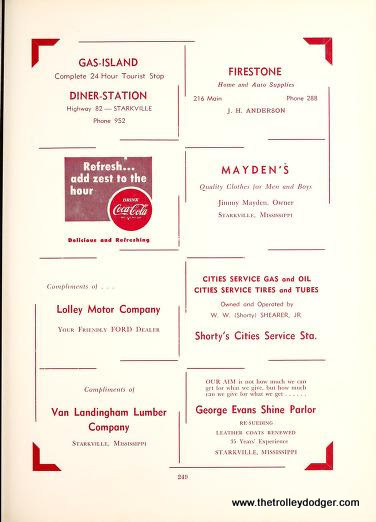 Above is a 1952 MSU annual showing ads for the Gas Island, mentioning the diner and tourists. THANK YOU! You are to be commended for the excellent job you do. This is the most reliable website I have seen. I talked to Mrs. V. J. Robinson, the sister-in-law of Mrs. Vernon Chesteen (about 90 years old). She remembers the trolley car motel. She said each trolley had 2 rooms so that would have been 16 rooms for the motel. Her two sisters worked in the trolley that was the diner. She is searching for old photos. Her mind is still clear as can be She has fond memories of the trolley car motel. Our town was crowded with students coming to Mississippi State University after the war. We had our largest increase in students during this time. Thank you again. We are only too glad to help out. 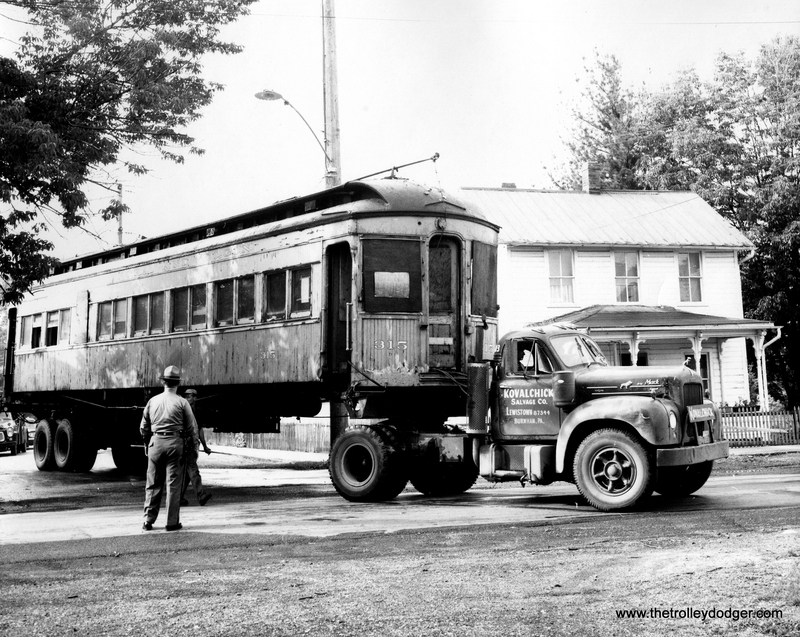 It’s worth pointing out that calling a double-truck Birney streetcar the largest in the world is a bit of hyperbole. I’m sure it was large, but of the same general size as plenty of other streetcars. North Shore Line Abandoned Track? Skokie Valley? Nope that track was used after the abandonment. 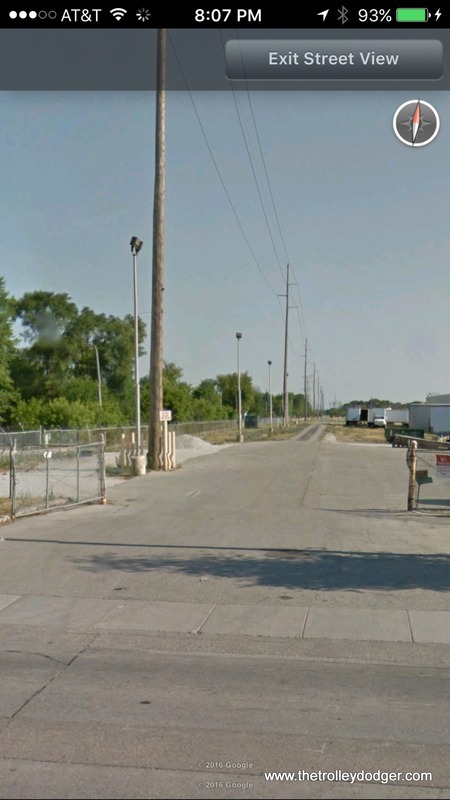 But the Shore Line might have some abandoned platforms– the Winnetka platform was still there in 2014. According to (http://www.sarahrothschild.com/real-estate–history-blog/archives/12-2014). 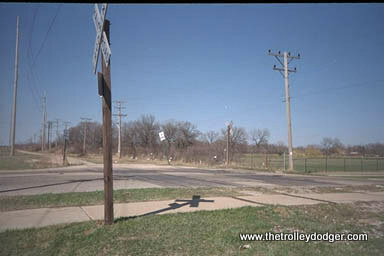 The Indian Hill platform was still there in the late 90’s according to http://www.chicagorailfan.com/mpupn.html. 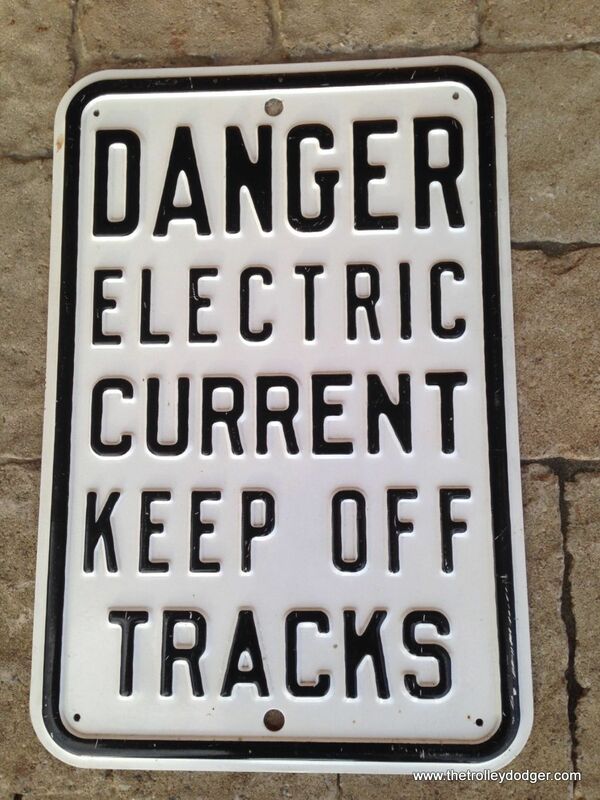 But the tracks… To find both the southbound and the northbound tracks, they weren’t dug up. They were surrounded in concrete almost impossible to notice. But… On 27 Ct. and 52 St. you will see them! (Be aware this is in July 2012 not 2016) I was so happy I almost started crying! 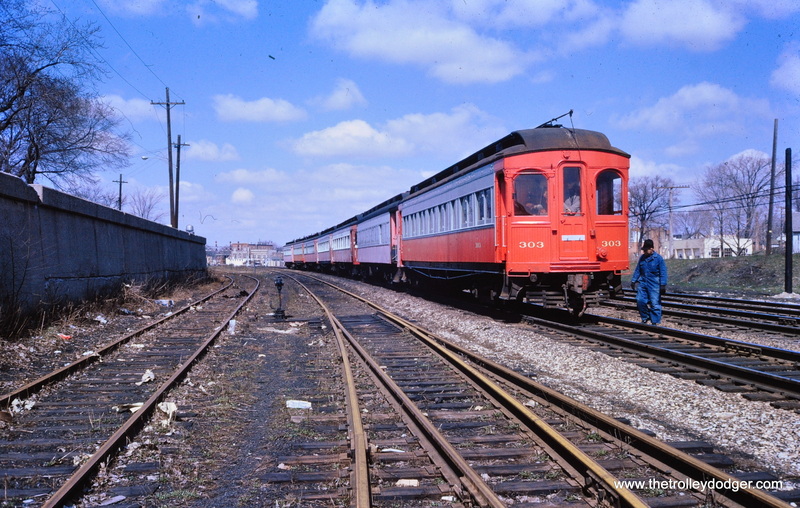 To know that the fate of a few yards of track on the Chicago Aurora and Elgin, would be the same for a few yards of track on the Chicago North Shore and Milwaukee! 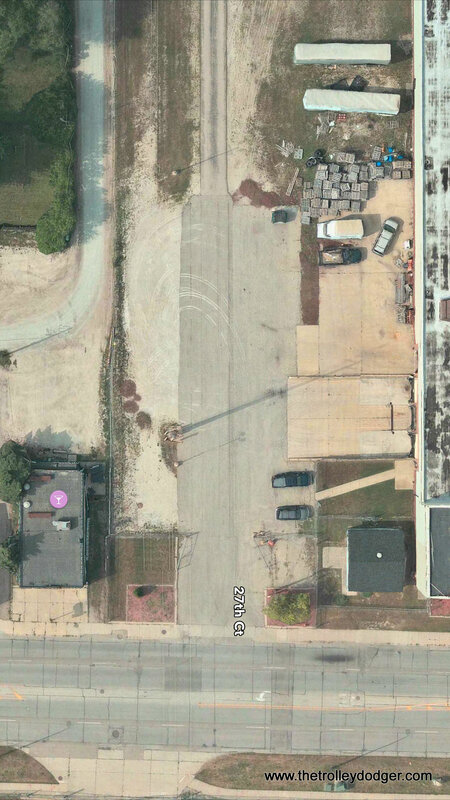 North of this location but before the line turns towards Racine, there might be some more. North of 45th St. I want to check it out, but I don’t live in Kenosha anymore, not even in the Midwest. No where near where I want to be. Good work, Joey. Perhaps one of our readers can tell us whether your detective work is correct. And in the meantime, keep trying to turn your dreams into your realities. That’s what life is all about. 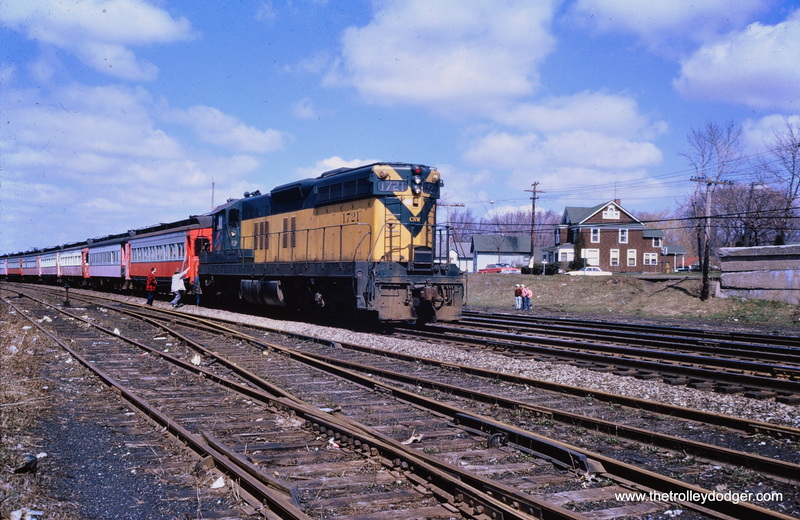 This is our 115th post, and we are gradually creating a body of work and an online resource for the benefit of all railfans, everywhere. To date, we have received over 117,000 page views, for which we are very grateful. Rev. Gilbert might be interested in “Staten Island Rapid Transit 1860-1965” by Irvin Leigh and Paul Matus, a softcover illustrated book. I have it stashed away somewhere. Amazon offers one for $94.95, but things like this show up on eBay, too. 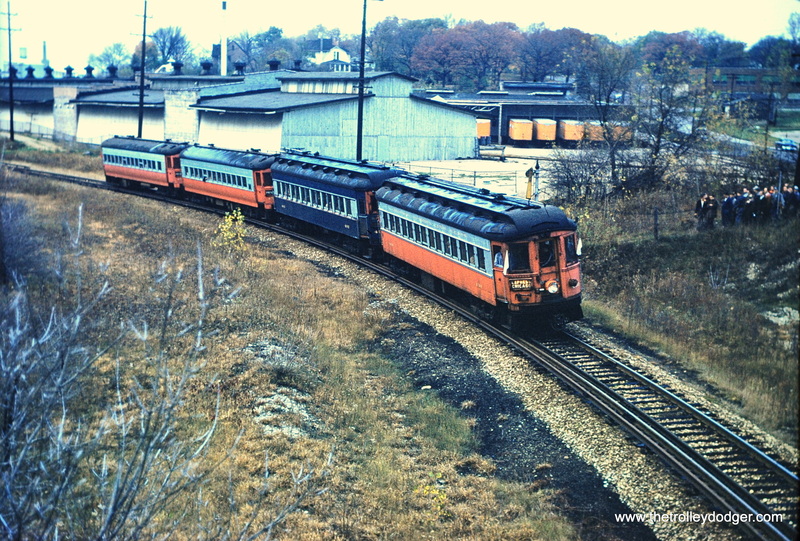 It includes coverage of the now-defunct North Shore line and a short branch of the mainline. Then there must have been a fourth train with the four cars in the 451-460 series that went to Trolleyville USA? It sure looks like Frank has it correct in this photograph and his order of cars. From looking at the photograph blown up, the car that has the boarded windows appears to be 315. We have the photos of the car sitting on the railroad flatcar in Altoona and the car widows are boarded up. 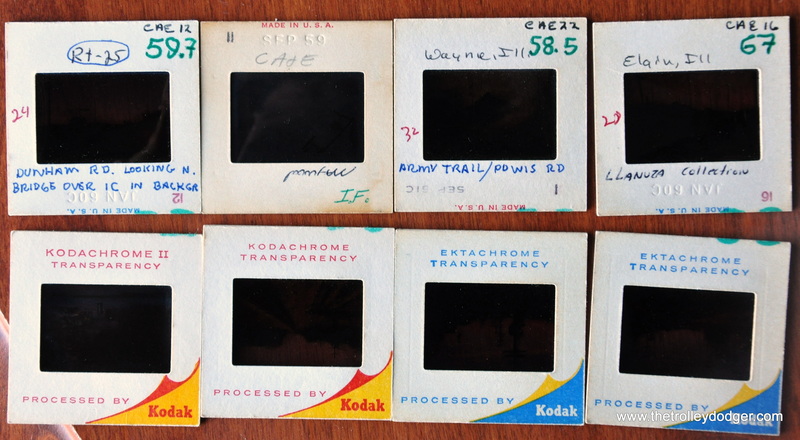 The dates on the invoices match the April 1962 dates of the slides posted here. I am guessing the car was stored in the Chicago area until our museum was ready to accept it at Rockhill Furnace. Unfortunately, most of our founding members have passed on or do not know the answers to these questions. And contrary to what has been published in at least magazine that I had seen over the years, the car DID NOT travel from Mt. Union to Rockhill Furnace via the East Broad Top narrow gauge railroad tracks. However, upon arrival in Rockhill, the car was initially placed on narrow gauge trucks while the standard gauge trucks were made ready and standard gauge track available. Thanks for the great photos and information everyone! Here in Chicago, we certainly appreciate your efforts, and all those who help out at the Rockhill Trolley Museum. The CA&E was a great trip. 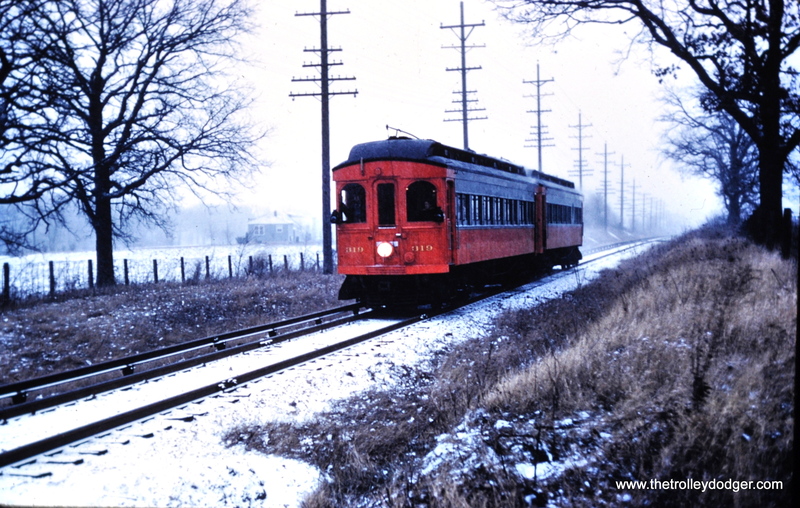 I used to ride it round trip every weekday in early 1954 from Forest Park to Spring Road Elmhurst. 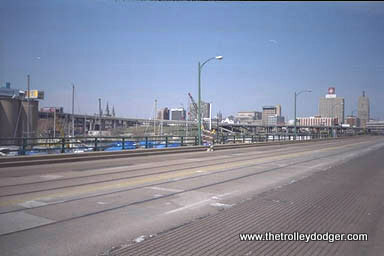 This picture looks like the 6th st bridge south of the Milwaukee North Shore terminal looking north. This bridge has been replaced with noting of the old structure. remaining.